An entrance is probably the most difficult room to decorate. And meanwhile, representing the first impression of your home. Often narrow, sometimes dark, this room requires more storage space dedicated to coats, to bags, to keys and other trinkets many of which we do not know what to do with! Use your walls! The walls are often only used for decoration but offer an undeniable surface and often untapped. Whether a shelf, drawers, coat rack, all these products are available to put on a wall! The floor space is freed and trinkets rows. Beware though: choose cupboards whose depth does not exceed 30 cm -approximately- to ensure a smooth flow of "traffic". The best friend to an impression of space: the mirror. Beyond the fact to contemplate before you leave home, the mirror expands the room. So rather than choosing a small mirror, see the big picture! 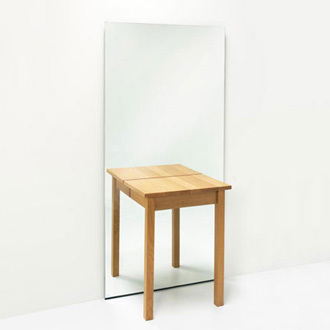 You can opt for a mirror placed along the entire length of a wall console with drawers. A mirror placed on the floor should have a height exceeding a few centimeters size. You will be able to verify that this stubborn cowlick was subdued and that your shoes are the same (Wake Up category: difficult). How to handle a dark entry? By putting the light! This seems logical, right? Brightness should not be too strong to ensure a cozy atmosphere but intense enough to be able to see clearly. The fact is that entrances are often already equipped with a ceiling light. Feel free to add a softer desk lamp to play with the intensity of light using them together or separately. The desk lamp may find its place on the console and / or in front of the mirror to accentuate brightness. Second, choose rather clear colors of furniture and storage in order not to darken the room more. Organic cotton : why is it more and more spoken about?